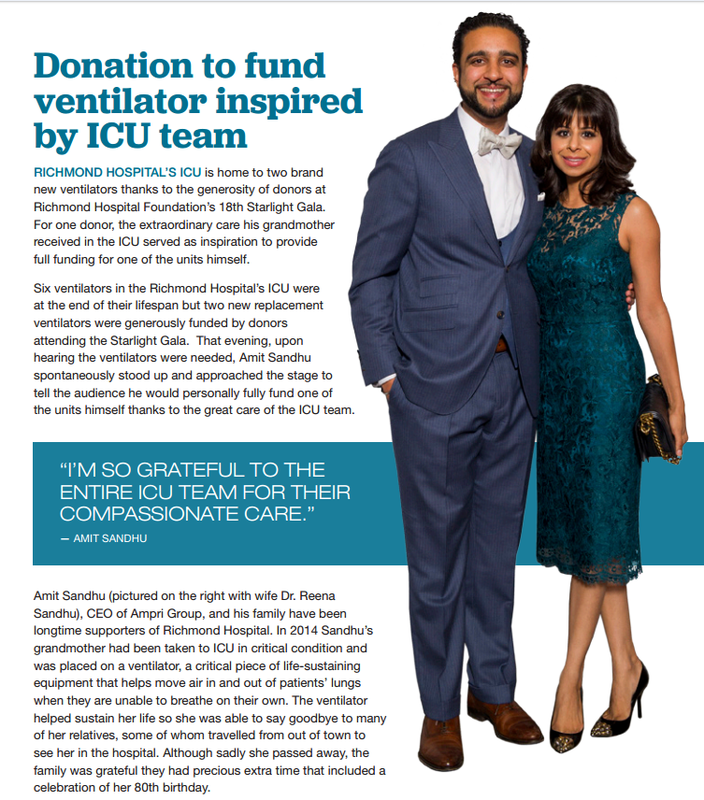 Six ventilators in the Richmond Hospital’s ICU were at the end of their lifespan but two new replacement ventilators were generously funded by donors attending the Starlight Gala. That evening, upon hearing the ventilators were needed, Amit Sandhu spontaneously stood up and approached the stage to tell the audience he would personally fully fund one of the units himself thanks to the great care of the ICU team. Amit Sandhu , CEO of Ampri Group, and his family have been longtime supporters of Richmond Hospital. In 2014 Sandhu’s grandmother had been taken to ICU in critical condition and was placed on a ventilator, a critical piece of life-sustaining equipment that helps move air in and out of patients’ lungs when they are unable to breathe on their own. The ventilator helped sustain her life so she was able to say goodbye to many of her relatives, some of whom travelled from out of town to see her in the hospital. Although sadly she passed away, the family was grateful they had precious extra time that included a celebration of her 80th birthday.